Many sources report that at least 200,000 people died from the atomic bombs that were dropped on Hiroshima and Nagasaki. Some even suggest that the number is actually over half a million people. What is even more eye opening is that 160,000 of the 350,000 population of Hiroshima were killed. That is almost half the population. These mostly innocent people had no plan on how to survive a nuclear attack because it is something that they have never seen before. So we see what kind of destruction can be caused by a nuclear attack. Mind you, Hiroshima was not a big city like many of the cities in our times today. This city was not urban. If it had been then those numbers could’ve easily doubled. Now many countries besides America now have the power of nuclear weapons. Many are enemies with each other. In the cold war many were on edge due to the possibility of a nuclear war between countries. The possibility is a very real thing. There has never been a weapon that man has created that they have not used. So far it has only been the United States that have but there is a very high possibility that others will as well. In addition to that today we face terrorism. There is now the potential for terrorists to get their hands on these nuclear weapons. Even nuclear power plants around the world can be attacked or have an accident like the one in Chernobyl. One bad incident can wipe out thousands. So there is a very real need to be prepared for such a situation. Ultimately the best way to survive a nuclear attack is by not living where there is potential to be attacked. Such locations include historic landmarks, important and highly populated cities, and military bases. If you live around one of these areas then it is best to strategically relocate. I highly suggest reading Strategic Relocation by Joel Skousen. Joel Skousen is an expert in home security. He has examined and studied all the states in America and identified potential threats in each area. Along with that he gives suggestions on how to survive if a shtf scenario happens. However, strategically relocating is not possible for a lot of us. So then we ask the important question of how to survive a nuclear attack. Below are some suggestions that I have put together. Now I’m not an expert on radioactivity and all that science stuff. So I won’t break it down in that matter but try to make it easy to understand. The most important part of that is to avoid looking at the blast directly. You can permanently lose your sight. From there it will be almost impossible to survive a nuclear attack. Find a basement, hallway or bathroom and stay away from glass. You have probably seen how the 600 mph winds from a nuclear attack can completely demolish a building. However, if you are further away from the blast zone then the effects will be less damaging. Just like how in tornado drills they teach you to be in these 3 spots the same rule applies. These parts of the building are typically the last remaining structure after a tornado. If you are out in the open then you need to look for a ditch or depressed piece of land. If there isn’t any then you need to begin digging immediately. Cover yourself with anything around you and stay covered until the blast wave passes. You will need to know how long the flash lasts. The longer the flash then the more powerful the bomb is. This information can help you estimate how big the blast zone is and how long you will have until the blast wave reaches you. If the flash lasts less than 10 seconds than you will know that it was a small bomb. This likely indicates that this was a terrorist attack and probably won’t see another one. If the blast is bigger than more likely the bomb was dropped by another country and there is potential for further attacks. In a previous post I discussed How to determine if and When to Bug Out. If you live a potential area for a nuclear attack you should already have this plan put together. However there are a few other factors to take into consideration. How far away was the bomb? This can be calculated by counting in between the flash and the blast. This is similar to when you count between a flash of lightning and the thunder. Each second will indicate a mile. The first 10 miles of the blast will be affected the most. Anything over 100 miles could give you time to bug out and beat the fall out radiation. Anything less than that you will be gambling. The other factor to take into consideration is if it was an air or ground blast. If the mushroom cloud is light and the head is almost non-existent then it was probably an air blast which means the radiation will stay in the air and carry away far and wide. If it was a surface blast then anything under 100 miles will be initially affected. Store water and conceal it if you haven’t saved up any water already. Get to the lowest part of your building preferably a basement. If you don’t have a basement then get to the center of lowest part of the building. Build a shelter with anything that you can find including furniture and inside doors. Cover your shelter as much as possible. The denser your shelter is the less radiation will infiltrate. Place your bug out bag and supplies within the indoor shelter. Stay in your shelter for at least 2 weeks. 2 days after the fallout it is safe for you to briefly scavenge the area. Have a change of clothes that you can wear outside and leave outside before coming back into your shelter. Your outside clothing should be a rubber or vinyl rain suit followed by a synthetic. Be completely covered. Listen to the news. If you are under attack about another country then you will need to analyze and break down any disinformation that the enemy may be using as propaganda. Be prepared for subsequent attacks. If you are in war or under attack by another country then there will be more than just a nuclear bomb. This is where your prepper gear will help you. Communicate with your prepper group and family to determine your next course of action. 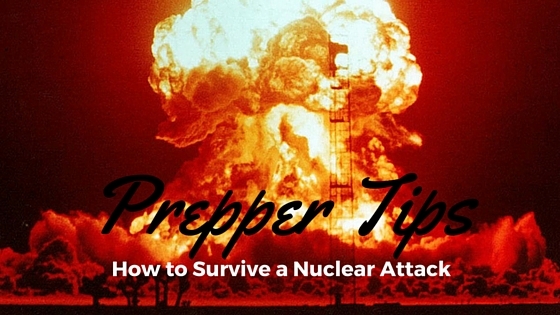 Altogether these tips should help you learn how to survive a nuclear attack. These tips won’t guarantee that you won’t be exposed to any radiation. It doesn’t guarantee that you won’t get sick or die. This is just a guide to build from using these skills that you have developed and utilizing all the prepper gear that you have been collecting.